Protects the central nervous system from damage and ischaemia. ¤ Those who wish to include a multi-action active compound in their anti-ageing regime that will act synergistically with their other supplements. ¤ Existing CoQ10-users should consider adding at least one idebenone capsule a day to their regime to benefit from the exceptional synergy that exists between these two variants that have different sites and mechanisms of action. For healthy individuals, 45 mg a day is adequate. 90 mg a day appears to be the optimal dose - at this level, improvements will be discernible after just one month and will continue to be felt during subsequent months. 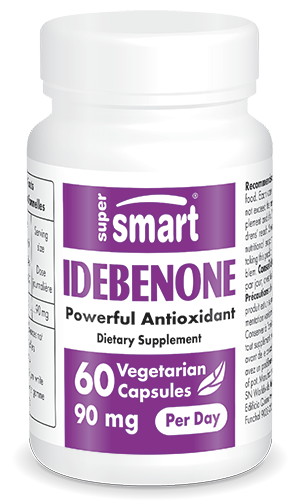 Each vegetarian capsule contains 45 mg idebenone. Take one or two vegetarian capsules a day at mealtimes, as required, or as suggested by your therapist.